Okay let me just say I have searched high and low for this voluptuous variegation. 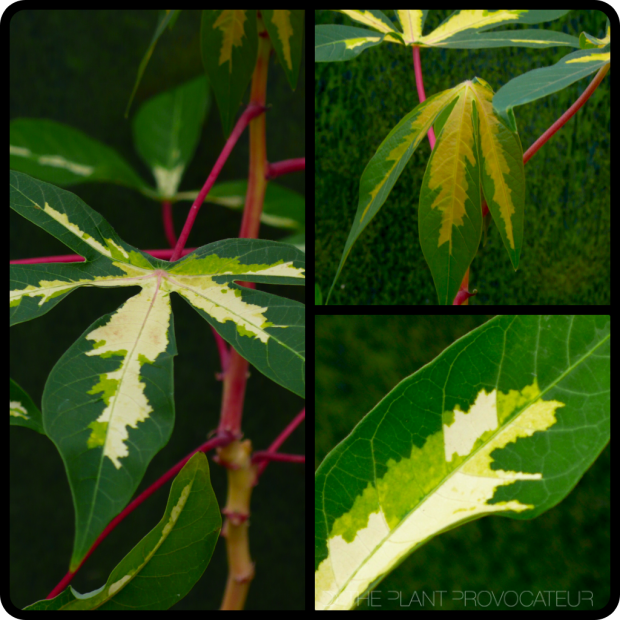 The ever elusive Manihot esculenta 'Variegata' or Variegated Tapioca plant (yes, as in tapioca) is a specimen plant so hot one look will set your soul on fi-yah. It's is one super glam plant that knows how to show the other plants how it is done. I mean, come on, look at that variegation, the luxurious palmate leaves, and those electric fuchsia petioles...stop it. This is a must have for anyone that loves elegant exotica! It grows up to 6 feet tall and looks amazing in containers. Give it full to part-sun, well-drained soil, regular moisture, and pull it indoors during cooler frostier months. As your reward, it will tantalize the eyes with its tropical temptation.